Global giant eBay has bowed to pressure from a West Country charity and agreed to stop selling a controversial Chinese medicine. The largest equine welfare charity in the world, The Donkey Sanctuary, based in Sidmouth, has persuaded the trading site to stop selling the Chinese medicine ejiao, which contains gelatin from donkey skin and is alleged to offer anti-ageing properties. The Donkey Sanctuary’s chief executive, Mike Baker, wrote to eBay’s President earlier this month. 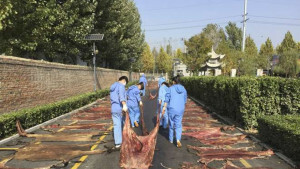 His letter highlighted the unfolding livelihood crisis, animal welfare disaster and potential consumer health risks associated with the unregulated ‘health’ product.